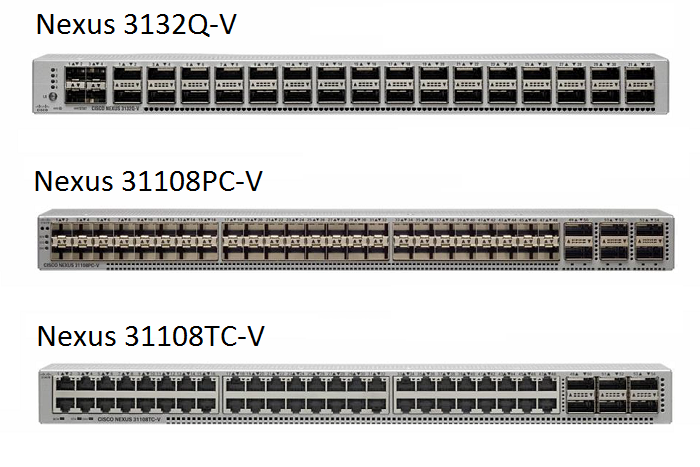 The Nexus 3100-v family of switches are based on the Trident2+. The ASIC has more buffer memory than its predecessor Trident2 and is built with 28 nM technology instead of 40 nM. There may be some method to Cisco's part number system. The theme here is Things you can do with 128 SERDES running at 10 Gb/s. It is amusing that Broadcom counts 128 10-Gb/s SERDES as a total switch bandwidth of 1.28 Tb/s. Cisco looks at the same switch and counts in and out separately and gets 2.56 Tb/s. Broadcom makes a companion gearbox chip that can convert between 10 Gb/s and 25 Gb/s lanes. Using up to four of the dual-port gearboxes, the TridentII+ can host up to eight QSFP28 100 G ports. Models with SFP+ [31108PC-V] and 10G-base-T [31108TC-V] are available. The SERDES can run at port speeds of 100 Mb/s, 1 Gb/s and native 10 Gb/s on the distribution ports..